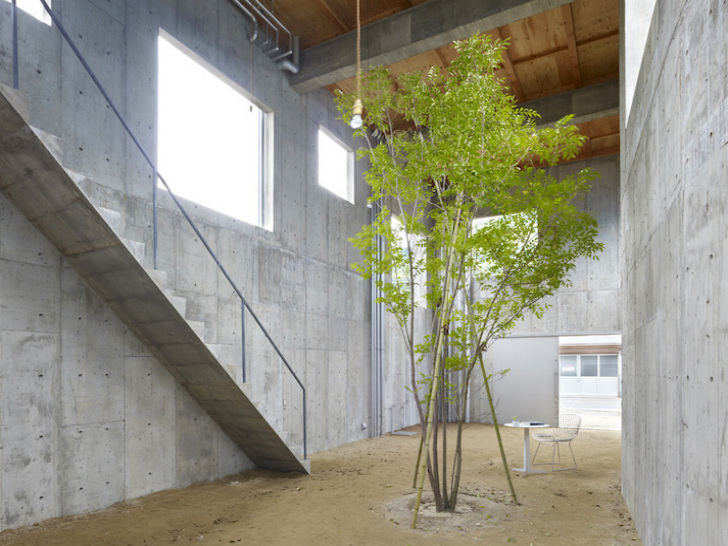 The ground floor of Suppose Design Office's House in Yagi is practically empty - except for a single tree in the middle and a staircase that leads upstairs. 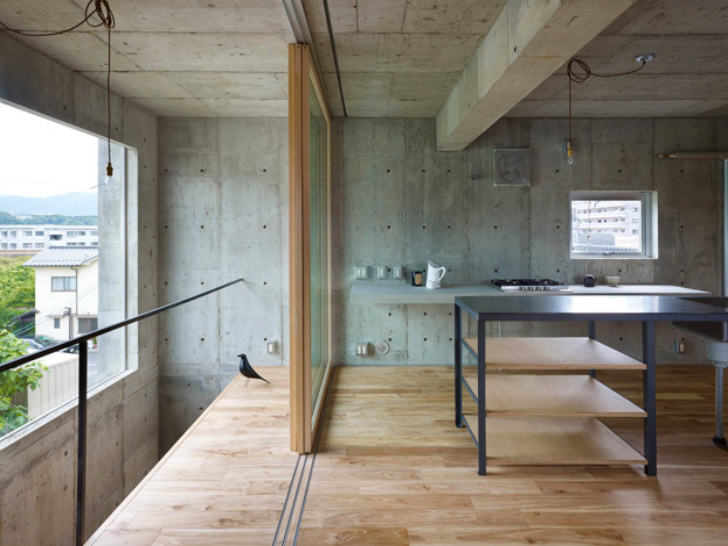 This Hiroshima home is an experiment in living that seeks to create novel connections with the outdoors. The concrete space is left largely open to maximize connections with the surrounding environment, and the minimalist layout meets basic needs while encouraging imagination and exploration. House in Yagi isn’t completely finished. In fact, the home was designed to not be completely finished even when the owner moved in – the concept was for the home to only meet the most basic needs. Suppose Design Office‘s design allows the owner to use the blank space to do pretty much anything. The ground floor is a vast open space with double-height ceilings. The simple dirt floor serves as a protected courtyard for play, relaxation, or reflection. A single tree planted in the middle of the room creates an immediate connection with nature, and the open windows without glass provide a direct link with the surrounding neighborhood. Fresh air, light, rain and wind can come in, but the interior is moderately protected from the elements. A long staircase climbs up the perimeter of the room into the enclosed living space above, which does have actual windows. Upstairs, the simple home features an open floor plan living, kitchen and dining space with a sliding glass window that serves as an entryway to the open-air courtyard below. Closed-off spaces provide room for the bathroom and bedroom. The simple and uncomplicated space can evolve as needed over time, or the owner can just enjoy the easy nature of the no-nonsense home. I really appreciate the idea of simpler living. I'd like to see an increase in freedom to build your own home in the US, by reducing residential building codes. And having lived with a sand floor immediately outside of my front door, I can say that you do tend to track a lot of sand indoors--though the extra long stairway geniusly appears to mitigate that! I would also prefer a more homey exterior. My style sensibility seems to come from the "Not So Big" way of thinking. To me, this home reflects more an unfinished office building. I think one could develop a homey exterior easily enough. House in Yagi isn't completely finished. In fact, the home was designed to not be completely finished even when the owner moved in. The ground floor is a vast open space with double-height ceilings. The simple dirt floor serves as a protected courtyard for play, relaxation, or reflection. A single tree planted in the middle of the room creates an immediate connection with nature, and the open windows without glass provide a direct link with the surrounding neighborhood. A long staircase climbs up the perimeter of the room into the enclosed living space above, which does have actual windows. Upstairs, the simple home features an open floor plan living, kitchen and dining space with a sliding glass window that serves as an entryway to the open-air courtyard below. Closed-off spaces provide room for the bathroom and bedroom. The simple and uncomplicated space can evolve as needed over time, or the owner can just enjoy the easy nature of the no-nonsense home. The home may never be totally "finished" in the traditional sense - the concept was for the home to only meet the most basic needs. Suppose Design Office's design allows the owner to use the blank space to do pretty much anything.